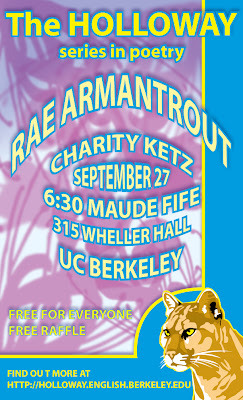 This one is the second Rae Armantrout poster for Holloway. I think I will stop using Photoshop unless I absolutely have to. I don't like the way digitally constructed and/or altered images look. I think that hand vectorizing things is fun, and it looks crisp and clean. I hand draw, then drop it into or recreate it in Illustrator. I like Illustrator very much. When I got my first job in graphics, the only thing I used was Photoshop. I digitally created cell phone antennae and superimposed them in real-life so that cities and clients could see how they would look finished. When I worked in advertising, there were people doing amazing things in Illustrator who I thought had magical powers or something. I like to think that I might be one of them now.